The profiles collectively have more than 82,000 followers. 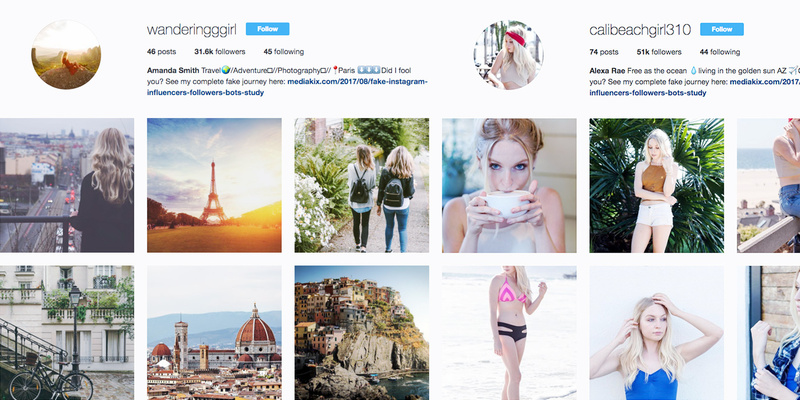 The first fake Instagram account called Calibeachgirl310 features images of a Los Angeles model and the second account features an amateur lifestyle travel photographer named Wanderingggirl that is populated with free stock photos. By using services readily available online, we bought followers and engagement for both of these accounts (about 50,000 and 30,000 fake followers, respectively). Then we signed each up on popular influencer marketing platforms and applied for daily influencer marketing campaigns posted by brands. We spent a total of approximately $300 on one and $800 on another for fake followers and engagement for the two accounts. Within a few weeks, brands offered our bogus Instagram influencers a combination of free products and money that totaled more than $500. According to eMarketer, marketers spent $570 million on Instagram influencer marketing last year, so any percentage of that going towards fake influencers or engagement is significant and represents an enormous amount of money at stake. It’s much easier to fake engagement at the smaller level. Unfortunately, this oftentimes afflicts smaller brands working with micro influencers when the time spent individually vetting each one for potential fake engagement negates working with them. This is the newest instance of ad fraud akin to the deceptive practices that have afflicted the display advertising space. For brands and advertisers seeking to get into influencer marketing, the rise of fake Instagram influencers and engagement presents a prevalent hurdle with no easy or automated solution. While some services or platforms offer algorithm-based detection of whether or not an influencer account has fake followers, these are cursory tools and should be considered as one of many factors to consider including vetting an influencer’s brand campaign performance history and working with influencers with reputable track records.